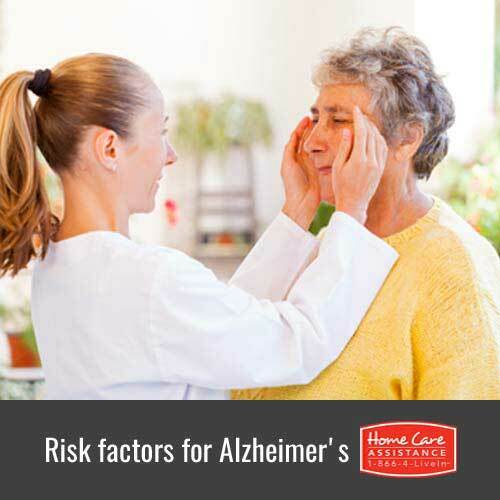 What Are the Main Risk Factors for Alzheimer's Disease? For families concerned about senior loved ones who are developing Alzheimer’s, knowing its various causes may help you adjust as the disease progresses. The Guelph Alzheimer’s care experts at Home Care Assistance have put together a list of common risk factors for the disease to help you better understand its roots and provide the best care possible for your loved one. A person’s risk of developing Alzheimer’s increases after age 65, and approximately 1 in 3 people will develop Alzheimer’s by age 85. Unfortunately, researchers have yet to determine exactly why the risk increases so dramatically as we age. Women develop Alzheimer’s at a higher rate than men. This is most likely because females have a longer life expectancy than males and are more affected by the increased risk related to aging. People who have a first-degree relative with Alzheimer’s are at a somewhat higher risk of developing the disease. There is a rare form of the disease called familial Alzheimer’s disease (FAD), which is caused by a rare genetic mutation. FAD is often associated with the early onset of symptoms and accounts for about 5 percent of Alzheimer’s cases. People with this form of Alzheimer’s are likely to pass the gene to their offspring. The brain is nourished by a vast network of blood vessels. The same conditions affecting the blood vessels in the heart also affect the blood vessels in the brain. Your loved one’s brain is more likely to develop the plaques and abnormal protein tangles that cause Alzheimer’s symptoms if the vessels are already damaged by other factors. After a head injury, the body releases large amounts of beta-amyloid and tau. These are the proteins responsible for causing the brain plaques and tangles associated with Alzheimer’s. Even one concussion can increase your loved one’s risk of developing the disease. If your loved one has been diagnosed with Alzheimer’s or dementia and you are unsure what steps to take next, turn to Home Care Assistance for at-home care Guelph families can rely on. Our part-time and live-in caregivers are expertly trained to meet your loved one’s complex needs as his or her condition progresses. From helping around the house with daily tasks to participating in brain-boosting activities, our caregivers ensure your loved one stays safe and comfortable at home. For more information on high-quality Alzheimer’s care services as well as dementia, Parkinson’s, and post-stroke care in Guelph, call (519) 954-2111 today. One of our experienced Care Managers would be happy to answer your questions and schedule a no-obligation consultation.